There is usually a Sunday service at 11 am every week at St Ffraid’s. When there is a 5th Sunday of the month a joint Ministry Area service will be held at 10.30 am at one of our churches. Further details will be posted on the church notice board. Ireland in a tiny coracle or sailing on square of |green Irish turf. A wooden church was constructed on the beach and stood there for many generations. Trearddur Bay is a popular holiday destination, so in the summer months our numbers swell with folk from far and wide. All are made welcome to our little community, joining in the morning services followed by refreshments in the Church hall, which is available for hire and in which a variety of activities take place during the week. 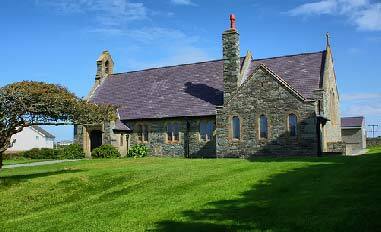 The church is situated on Lon St Ffraid, the main road through Trearddur Bay. It is on the left when travelling away from Holyhead towards Valley.